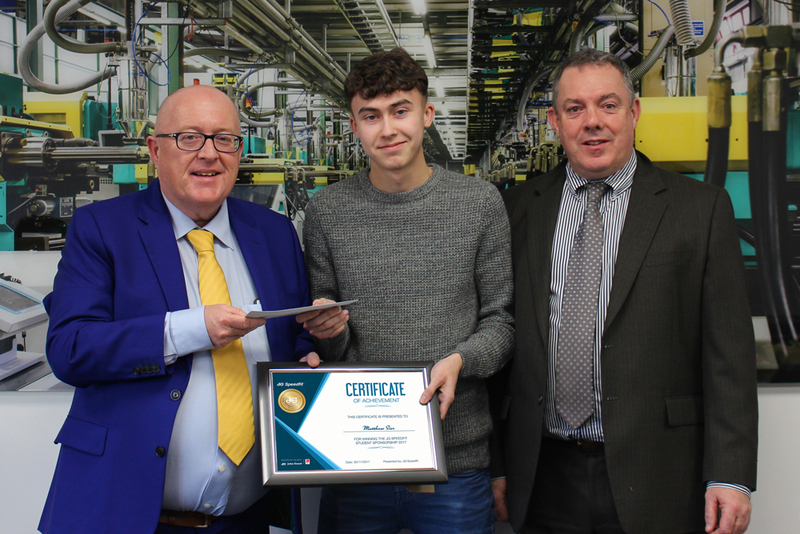 The new sponsorship with Coleg Y Cymoedd (Ystrad Mynach Campus), home of Wales’ leading Plumbing & Heating course, sees Matthew Sier, a Year 2 student, win a bursary worth £1,000, to help complete his studies. Matthew was selected after a fierce competition to find the student who best demonstrated their commitment to plumbing. He had the skills to succeed in the industry. Lecturers at Coleg Y Cymoedd nominated 6 students who had performed well in Year 1. The candidates then visited the home of JG Speedfit in West Drayton, answering competency-based plumbing questions and being interviewed by a panel of lecturers and JG Speedfit experts. “I feel grateful towards JG Speedfit for giving me this opportunity. I learned some interesting facts about push-fit plumbing and enjoyed the factory tour, seeing how Speedfit products are manufactured. I had put a lot of hard work into preparing for this day and am totally chuffed about winning it.” says Matthew. “Matthew will be a fantastic ambassador for young plumbers. We were impressed by his dedication towards the profession and the technical knowledge he is already demonstrating. We’re delighted to help him with his studies and look forward to seeing how he gets on,” explains Nigel Sanger, Technical Director at JG Speedfit. As well as receiving £1,000 per academic year for the remainder of the course, on completion he will also receive a toolbox and workwear from JG Speedfit. The choice of Coleg Y Cymoedd (Ystrad Mynach Campus) reflects JG Speedfit’s close ties with the college, where Nigel Sanger first learned about plumbing and heating. “I firmly believe that a theoretical understanding of plumbing is vital for the long-term health and profitability of the industry. We want to create a platform where future talent, like Matthew, can be rewarded and supported for their commitment towards all aspects of plumbing,” says Nigel. As part of the partnership, JG Speedfit is supplying core-plumbing product to the college, as well as supporting the creation of a room dedicated to JG Speedfit UFH, where students can learn the theoretical and practical elements of underfloor heating installation. “There are exciting opportunities for the plumbers of the future, especially in underfloor heating, and we want to help them get the best possible education,” adds Nigel. JG Speedfit is planning to repeat the sponsorship with Coleg Y Cymoedd in the 2018/19 academic year and is also looking for partner colleges in other regions of the UK. To learn more about the opportunities at John Guest, please visit our apprenticeships section or alternatively, you can connect with us on social: @jgspeedfit.